I think I’m kind of a Quick Developer, kind of making things quickly (good side) or leaving things unfinished if not finished quickly(other side). 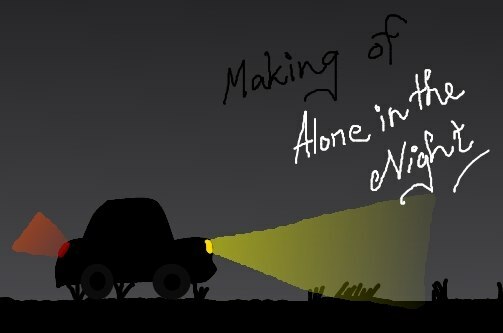 So ‘Alone in the Night’ turned out to be my yet another quick project out of a quick idea, and done quickly i guess. One interesting thing is that i kept a DevLog Text file, which i update with things i did that day or that time. Its kind of Boring but later when you look at it, you will be amazed you did all those and made those stupid mistakes and all (First thing i learned). Try that when you do something next time. I’m giving the whole Devlog here and will add Notes here & there to point out something i learned or find interesting. – Looks good i hope..
(and some complex ones) were made in this simple free software. As game progressed, the number of Scripts grew larger, its a mess to find any bugs here. Note : Interruptions Occurs, but later when you come back only then you realize the value of the Comments and Proper Variable names. Comment & give Long Meaningful names to variables, even it seems extremely Boring & unnecessary. Note : Playtesting is highly Important. You’ll never know how they will play it no matter how perfect the game you think it is. On second level, i put the bird on a tree, just drove away the bird by honking horn and next stage comes. My cousin got stuck in this level, don’t know what to do. So i changed it to a Switch, and bird sitting on that switch. & Lots of hints. pacdv offers a few instrumentals for you to use royalty free. They just ask that you mention “Music by www.pacdv.com/sounds/” in your credits. Note : I decided to record sounds & Music (!). Even recorded Rain sounds. But not quite good. So thought of searching for music & sounds online. There exists lots of great quality sounds and music online. So why make all things myself, lets add some more people in the credits. – Fixes Camera Transition Speed. Thanks to my Friend Parameswaran. – Final Build (of Demo). Note : Hope you have enjoyed it. Working on some other Games.